16. The Oncoming Flood of Specialty Coffee: What Does It Mean For Cincinnati? Let’s break it down. In 1999, when I was 9, of the coffee drinking adults only 9% were drinking specialty grade coffee. Fast-forward a decade. 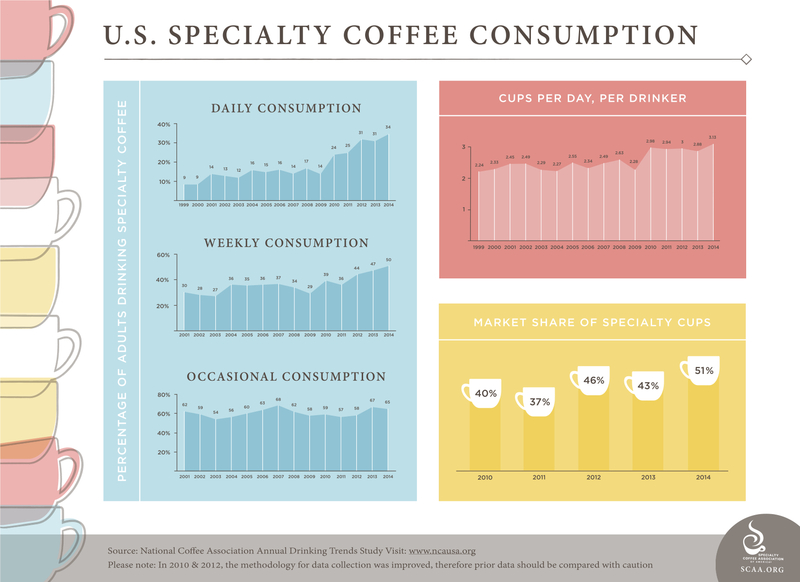 Only 14% are drinking specialty coffee. A 5% raise in ten years is disheartening, but look at the past five years. Specialty coffee has exploded! We’ve gained a 20% increase in market share and are now at 34% with a steep trajectory towards exponential growth! Okay, so what does that really mean? It means that 1 in 3 people are drinking specialty coffee daily compared to 1 in 10 people fifteen years ago. It means a serious market is exploding. It means coffee lovers will be able to experience an ever-increasing array of flavors and coffee infused inspirations. It means more shops and roasters will be opening (and hopefully surviving). It means increased competition from large corporate players and the independents. But what it really means to me, and hopefully to many others, is that the sense of community formed through the catalyst of coffee is about to explode. I think we all know that being united, as humanity, is better than being isolated as an individual. Those that have encouraged me, loved me, and put me a on path to success were almost all those that I met through coffee community and I have no doubt that many others in Cincinnati can share that experience. This is what I’m excited about and what I believe all of us in the specialty coffee community should be excited about. Our world is one that unites people. Let all of us involved, roasters and shop owners, baristas and consumers, and no-nonsense purists be a voice of support—not only for the specialty coffee industry as whole—but for each other as the specialty coffee community in Cincinnati.